At just over 30 liters ths Boundary is one of the largest in Granite Gear's new line of Barrier backpacks. It makes excellent use of this space through it's multi-compartment design, including a protective Barrier stash pocket, a Gear-Tec laptop sleeve and a convenient multi-pocket organizer. However, the most distinctive features of the Boundary are it's external storage options. At just over 30 liters ths Boundary is one of the largest in Granite Gear&apos;s new line of Barrier backpacks. It makes excellent use of this space through it&apos;s multi-compartment design, including a protective Barrier stash pocket, a Gear-Tec laptop sleeve and a convenient multi-pocket organizer. However, the most distinctive features of the Boundary are it&apos;s external storage options. 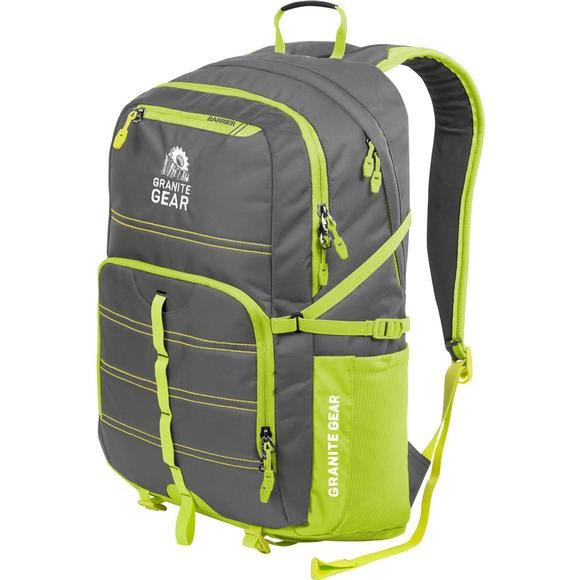 It has two large strech mesh hydration pockets, a daisy chain loop, and convenient stash straps located on the bottom of the pack. The Boundary has a raised back panel with lumbar support, as well as a breathable, load absorbing shoulder harness. The Boundary&apos;s unique ability to comfortably carry loads both inside and outside the pack is granted by this luxurious suspension system.